High gloss. 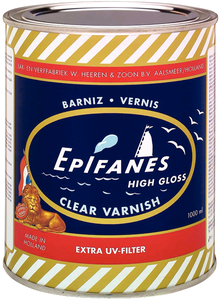 Traditional varnish manufactured with tung oil, ultraviolet filters and urethane resins for superior exterior protection. Excellent flexibility and water resistance in all climate conditions. Can be applied to interior or exterior surfaces above the waterline. Application: brush, roll or spray.